Emily Ann Benedict: How Book Signing #3 Turned Into The Most Amazing Of All. How Book Signing #3 Turned Into The Most Amazing Of All. Last Saturday was my third official book signing. I have to say, this will probably be the one I remember the most for two major reasons. I showed up around 1:30 to find a table already set up and a large stack of my books in front of it. Much to my surprise, the manager had order more than twice the number of books than stores usually do. That seemed like a very good sign. ….But two hours later, as the signing drew to a close, that stack of books was practically the same size. I’d only sold 5 books. And I knew unsold books were always returned to the distributor, which looks very bad when the end of year tally happens. So, as 4:00 neared half my brain was screaming, “This is bad! This is very, very bad!” and the other half was calmly saying, “This just happens sometimes. Everyone has bad days. God is still good and it will all work out.” Frankly, the smile I was had on was a trial. Then all of a sudden the manager walked over, looked at the stacks of my books and the other authors' and without hesitation said, “Go ahead and sign them all. I’ll put up a local author display,” and then walked away. Sign them all? That means he can’t return them. Which means the distributor counts them as already sold! HOW GOOD IS OUR GOD?! Somebody smile wildly with me! As we walked back to the car my mom said, “I’m sorry you didn’t sell very much.” I had to say, I was glad it worked out the way it did. I got to see God show up and politely tell me He is much better at selling books than I am. Agreed! That was the first part of this amazing day. The second part was the people I was surrounded by. Sitting next to me at that table was Denise Dieser and Terry O’Leary, authors of Prayer Chain Ministry. Terry was my Sunday school teacher when I was ten years old. I kid you not. 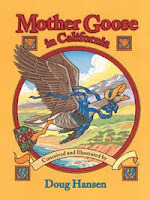 :) A few feet down was Doug Hansen, author of Mother Goose in California. Doug was my art teacher when I was twelve years old. Does anyone hear, “It’s a small world after all,” playing in the back ground? Me, Denise Dieser, Terry O’Leary, Doug Hansen, and Kim Gruenenfelder. Doug Hansen’s book. This is one of the most beautifully illustrated books I’ve ever seen. AWESOME! I love hearing God-stories like that.